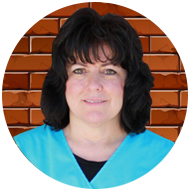 Kerry McCullough is a Registered Dental Hygienist with Langworthy Family Dental. Kerry spent two years at Loras College before transferring to the University of Iowa, earning her bachelor’s degree in 1986 and has been working in the dental field ever since! Helping people attain and maintain their oral heath goals remains her favorite part of the job, but she also enjoys that no two days are the same here at Langworthy Dental! As her last name might suggest, Kerry loves all things Irish, an admiration she shares with her husband of 31 years, Rob, who just so happens to play in an Irish band! She also enjoys watching the Green Bay Packers, gardening, traveling, fishing, and spending time with family at their farm/cabin just outside of Dubuque. Kerry and Rob have four children and two grandchildren who they adore.